When debating over design styles and color schemes for your next project, it can make a world of difference to see before and after photos of real projects. Here at Snappy Kitchens that’s something we love to do for our clients (and for us! ), just so they can see how much of an improvement they have made in their kitchen space. We cover everything from re-facing or refinishing cabinets fronts, all the way to selecting the finishing touches of hardware. 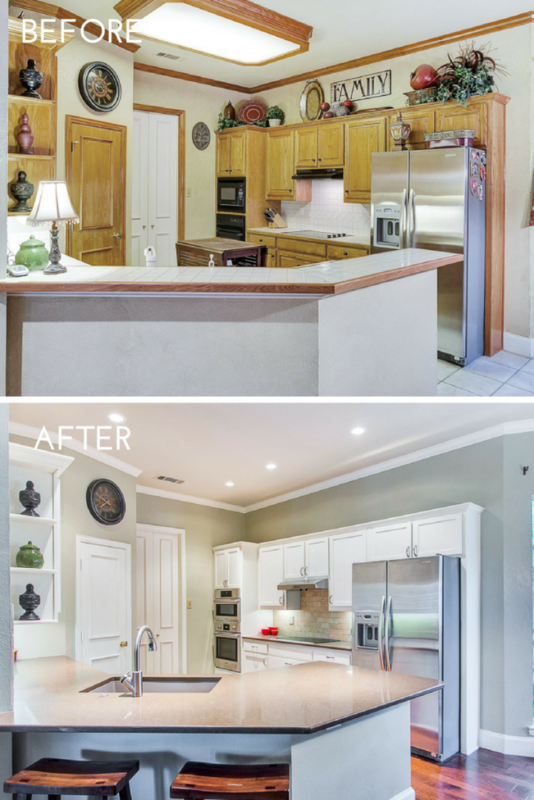 It’s amazing to see what paint and new finishes can do to transform a space! 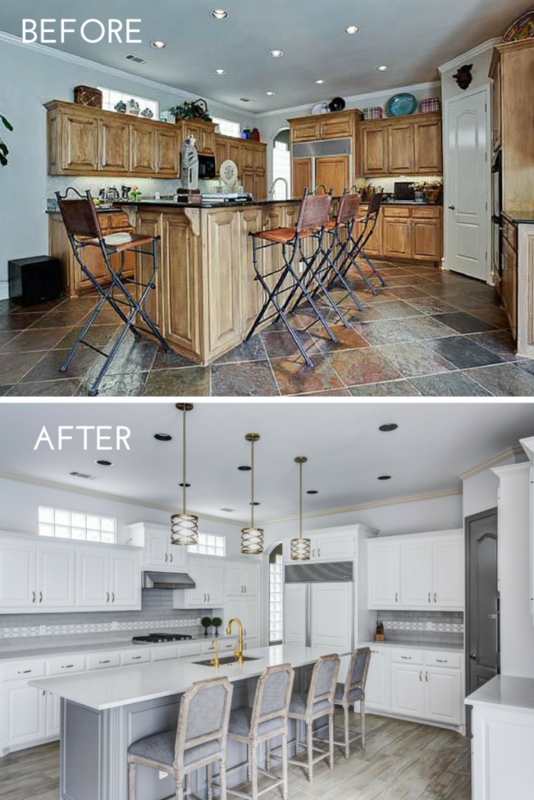 Today we will take a look at three examples that show major transformations without the need to replace any cabinetry! This first kitchen started out as space that already had great bones. 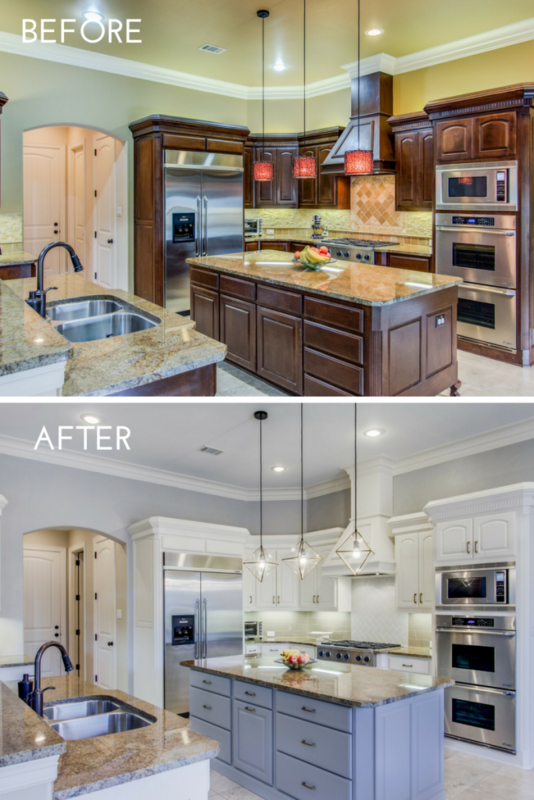 It had a nice open feel and good quality cabinets, but our clients wanted a new and fresh color palette to match their taste. We used their existing cabinetry and refinished them to a crisp white paint and an island painted grey. We also lowered the bar on the island to open the kitchen up even more. Along with this, the flooring, backsplash, and countertops were replaced with more modern looks. Lastly, the golden brass kitchen faucets are the final touch that gives this space a pop. Our next kitchen is another great example of a space that had a nice open feel and great quality cabinetry, but again needed an updated look to match their clients design style. This space went from a color palette of deep wood tones and was lifted to a bright and airy space. As a bonus, their existing flooring and countertops were re-used in this design, but still looks new! Also, we love how the pendants give the space a dramatic look, a perfect touch! Lastly, we take you to a space that was transformed by replacing the cabinet fronts, countertops, and backsplash. However, what creates an additional impact to the change of finishes is the removal of the bar top and the lighting box in the ceiling. It seems so minor, but removing these items helps to make the kitchen seem much more open without having to change the layout. The kitchen has a completely new look with its new finishes and openness.